Subhash Transport Corporation is an acclaimed Service Provider Company offers a range of sophisticated and well engineered Material Handling Equipments. Our services range includes of Crane Services, Cargo Services and Material Lifts, crane hiring, crane rentals, contractual lifts, lifting and shifting, erection of plant and machineries, etc. Since our establishment in 1996, we have grown up constantly facing many pros and cons in the industry. The continuous approach and vision to excel has helped us in drafting a niche in the industry and own a reputation among our client. In all these years, we have won a large clientele that includes clients of international repute like Punj Lloyd, Essar Oil Rigs, ONGC, J K Cements Limited, Bajaj Hindustan Sugars Limited and Gujarat Ambuja. Guided by a visionary and able mentor Mr. Amit Chanana, we have acquired a Private Limited status as a company. His experience and expertise has guided us at all times and offered a motivational support to complete team under every circumstance. We are backed by a team of well versed and experienced professionals, who come together at work from varied back grounds and work in proper coordination to each other. People working with us are dedicated and understand the true meaning of services offered by us. Services offered by us are designed to win satisfaction of our clients and maintain life long relations with them. Services offered by us are brought into application in industries such as thermal plants, cement plants, gas plants, nuclear plants, fertilizer plants, refineries, road & bridges constructions and railways. These services are offered at reasonable prices and are highly efficient because of the latest and sophisticated machines and cranes available with us. We are the leading provider of high-performance hydraulic telescopic cranes, mechanical crawler cranes, truck mounted cranes, hydras, forklifts, trailers odc transport, lattice boom truck cranes, hotmix plants, asphalt plants, drum mix plants for use in all kinds of industrial applications. STC is the most diverse specialist equipment rental company. STC provides equipment rental and contract management services to key businesses in virtually every sector of Indian industry. STC is uniquely positioned to provide rapid deployment of equipment and personnel to meet clients’ most demanding contract requirements. STC operate the largest and most comprehensive holding of equipment for hire in India. Our record of investment in the latest and most practical technology is unrivalled in the industry. Our breadth and depth of expertise and vast knowledge and experience enable us to provide our clients with often innovative, always practical and cost-effective solutions to their equipment rental requirements. Backed by functional specialists in areas such as Safety, Health & Environment, Accountancy and IT, STC’s mission is to deliver optimum service, add value and drive through cost savings in all aspects of our range of services. Over the period of time we have proved our leaderships in hydraulic telescopic cranes, mechanical crawler cranes, truck mounted cranes, hydras, forklifts, trailers odc transport, lattice boom truck cranes, hotmix plants, asphalt plants, drum mix plants etc. Clients rely on STC’s capability for intricate lifting projects, the most all-encompassing tool and equipment provision, complex managed contracts and operationally sensitive power generation and industrial lighting applications. Above all our excellence in A leading provider of high-performance hydraulic telescopic cranes, mechanical crawler cranes, truck mounted cranes, hydras, forklifts, trailers odc transport, lattice boom truck cranes, hotmix plants, asphalt plants, drum mix plants etc, sets us apart. We are supported by our state-of-the-art infrastructure spread in a wide area. To help our clients, we have sophisticated vehicles, machinery and cranes that have the ability to meet the needs of our clients. 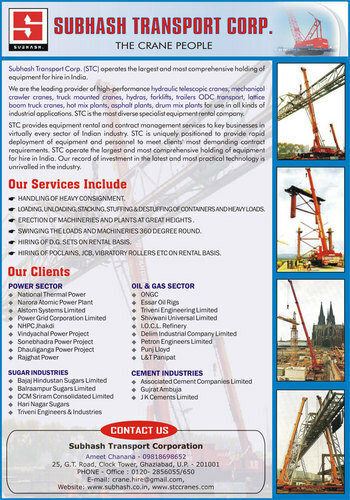 STC Cranes introduces itself as a prominent leader of high performance and supreme quality hydraulic telescopic cranes, mechanical crawler cranes, truck mounted cranes, hydras, forklifts, trailers ODC transport, lattice boom truck cranes, hot mix plants, asphalt plants, drum mix plants for use in all kinds of industrial applications. 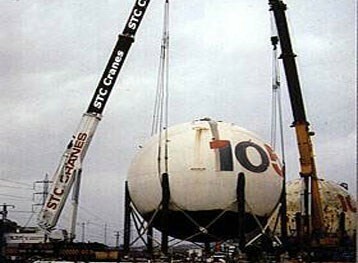 STC takes pride in providing all sorts of crane services at affordable prices. We are reckoned among reputed crane companies for offering a range of different cranes STC provides equipment rental and contract management services to key businesses in virtually every sector of Indian industry. Being a renewed crane supplier, we also offer our cranes on hire in Delhi. Every member of Subhash Transport Corporation personnel accepts responsibility for the management of the relationship between our business and our clients, regardless of size or value. For those clients requiring a fully managed equipment rental service, or specifically tailored national or multi-site service, we offer a specialist Key Account Management function, providing expert operational and relationship management by both office based and mobile professionals. Being acclaimed service providers, buyers and retailers of a wide range of Material Handling Equipments, we have achieved a huge clientele in Indian and international markets. Services offered by us meets international quality standards. The equipment rental industry has always depended upon the balanced combination of technology and people to provide an effective service to customers. As business becomes increasingly technology driven, Subhash Transport Corporation continues to develop innovative, practical applications of the latest available technology to provide added value service for our clients. Subhash Transport Corporation continue to invest in the most modern and technically advanced plant and equipment. Effective application of our equipment, backed by our expert technical support and advice, enables our clients to drive cost savings into their business through quicker, more efficient solutions to meet their contract requirements. Of course, technology and leading edge equipment, no matter how effectively utilised, can never overshadow the critical importance of people in a service business such as ours. Our personnel are key to the continued success of all aspects of the STC’s activities and are undoubtedly our most valuable resource. These initiaves help us to deliver the best in hydraulic telescopic cranes, mechanical crawler cranes, truck mounted cranes, hydras, forklifts, trailers odc transport, lattice boom truck cranes, hotmix plants, asphalt plants, drum mix plants etc. We are supported by a team of highly qualified professionals having wide range of experience with them. People working with us are proficient performers and come at work from varied backgrounds. To make our professionals abreast in the industry, we provide them with regular training programs from experts of the industry. We have divided our complete team into units as per their expertise and that makes us able to provide best solutions to our clients as per their requirements. We believe in the fact that our industry has made this historic success based upon the fair amalgamation of technology and people to provide efficient services to our esteemed clients. Today technology has made it possible for us to meet each and every step in any possible means. For this we implement the latest technological methods to provide value service for our clients. The equipment are technically sound to deliver the services in the best effort and convert the impossible assumptions to a complete solution. We are having a strong team who makes these efforts wit ease. It is only possible to impart solutions in all the aspects and hence deliver the services with the aid of the newest technology and innovations by our experts. We are a client centric organization engaged in offering premium quality services to our clients. To win their satisfaction, we have designed fair and ethical business norms to offer solutions of international standards. We are one of the largest service providers of Material Handling Equipments and services offered by us have compilation of quality and latest machinery.